We’re on a Groom wedding planning kick this month! Our Grooms could always use a little extra attention though…sorry ladies, but we tend to take up majority of the spotlight with a wedding. Our previous blog focused a lot on certain steps to help make the wedding planning less stressful for our Grooms, but this post is going to focus on how we (as the Brides) can make sure we involve our Groom in the wedding planning process. As a soon to be Bride myself, I’ve noticed it can be REALLY easy to just start wedding planning while leaving the Groom-to-be behind. It’s not that we don’t want our soon to be hubby involved, but I think many of us think that wedding planning is “just a girl thing” or “he doesn’t care about those details”. Let’s get real, most women start dreaming of their wedding when they’re little girls dressing up as a Princess. Guys…. not so much, but that doesn’t mean they don’t have a desire to be involved. So, Grooms, this one is for you again in the hopes that your wedding will be everything you BOTH imagined it to be. There are all kinds of website that can help you create a wedding website including WeddingWire.com and TheKnot.com. Most guys ask, “Why do we need a wedding website?” If you think about it, there’s probably a good majority of your guests that may not realize the moment you two met or what your favorite hobbies to do together are. You’re going to have many guests that aren’t involved in your day to day lives and a wedding website allows you to share that with them. The great thing about a wedding website is it allows for you to be creative: choosing your background display, your photos, creating your “about us” section and maybe some fun facts about the two of you together. 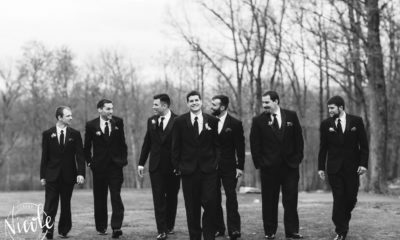 It gives the Groom a chance to be a part of sharing your story together! With each of our couples at Sand Springs we get to sit with them and go through a food tasting for their wedding day. What guy doesn’t like food? This is a great opportunity for you to involve the Groom because he can be a part of choosing your menu, making changes and even come up with some fun, unique choices to offer to your guests whether it be for cocktail hour, dinner or late-night munchies! He may also have a better idea of what most of your wedding guests would prefer to eat on your wedding day. Since DIY is big in the wedding industry, if you have a guy who can build or create things, this is another chance for him to be involved. Whether it be building a welcome sign, to your cake stand, or centerpiece holders, not only will your guy put his special touch on the wedding day with homemade items, but it will probably save you a TON of money! Several Grooms we’ve had at Sand Springs have turned this opportunity into a chance to give their Bride to Be a sweet customized gift for their big day. Budget is always a big topic for both the Bride & Groom. Most likely, you two have never had a joint bank account or have had to manage large bills together. Take this as a chance to give your Groom the reigns on putting the budget together and taking care of planning out the finances. This can be a planning task you two can do together as well, but it’s a good practice run to see how you both will be able to manage money together once you’re married. Luckily with this aspect of planning, you both probably have a good general idea of where your closest family members should sit and an idea of who should NOT sit together. Let your Groom put together a seating chart for the wedding day…you may be pleasantly surprised. Guys, don’t take this task lightly either. You’re probably not going to get away with putting your crazy cousin the closest to your table so just keep in mind what will make both of your families and friends pleased overall.